Nonprofit partner Guardian ad Litem Foundation Second Circuit, Inc. (GALF2) is always looking for new and exciting ways to recruit volunteers and raise money. 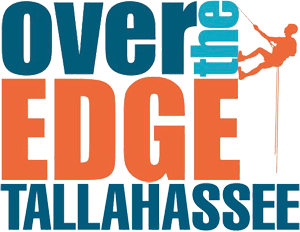 On Saturday, April 21, 2018, they did just that by participating in Over The Edge Tallahassee, a unique event benefiting our program and two community supporters. Hosted by Killearn United Methodist Church and The Living Harvest Thrift Store, this fundraiser supports local nonprofits by sending individuals over the edge: rappelling from the roof of the sixteen-floor DoubleTree by Hilton hotel in downtown. During the beautiful and warm day, GALF2 board members and program staff ran an information booth set up on Adams Street at Park Avenue where they spoke with the public and raised awareness for our mission. Arguably the most exciting parts of the day, however, were when two of our own went up to the roof and then over the edge. The first on deck was your author, GALF2 board member and webmaster David July. I had volunteered a month earlier, but did not learn that I had been selected to go until twenty-four hours prior. It was an exhilarating experience, not one that I would have previously imagined doing. Less than thirty minutes later, Second Judicial Circuit Guardian ad Litem Program Circuit Director Deborah Moore appeared at the rooftop ledge and then joined the "edger" club. Following her rope descent from the roof, Moore was all smiles. Killearn United Methodist Church has been providing contributions to our program for several years. Since 2015, their iServe community service initiative, led by John Cousins, has donated over 210 beds (about $50,000 worth) plus bedding, storage and delivery services to our Sweet Dreams Program. The Living Harvest Thrift Store also helps by acquiring discounted mattresses, box springs and frames. Speaking with Cousins during the event, he granted permission for a return to the roof to take photographs. Having just gone through it myself, it was fun to witness people stepping through the process of going over the edge for the first time. Among those who rappelled during that time were Betty and Ginger, lifelong friends known as "The 80s Ladies", and Cousins' wife Julie. Thank you to everyone who donated and helped work the event!